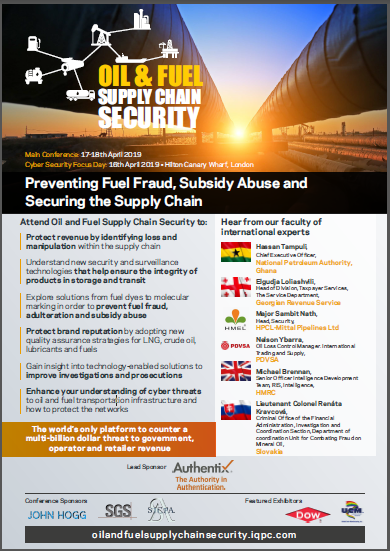 The Oil & Fuel Supply Chain Security Summit, taking place in London, 16-18 April 2019, is the world’s only platform to counter a multi-billion dollar threat to government, operator and retailer revenue. Building on last year's success, the 2019 summit will deliver additional exploration of security and surveillance solutions to counter illegal bunkering, ship-to-ship transfers and the tapping of pipelines, storage facilities and other transportation infrastructure. View the full list of speakers and sessions in this year's agenda by filling in the form below.